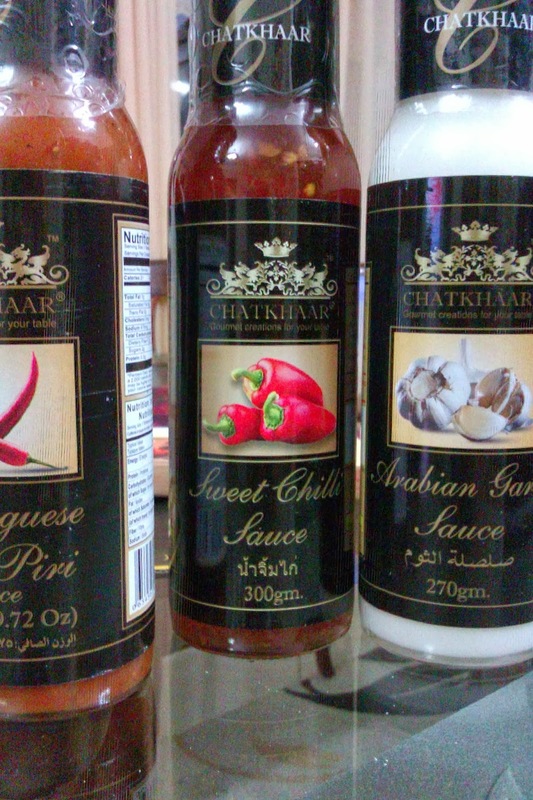 A few days ago I received a gift pack of sauces from the brand Chatkhaar with directions on featuring a recipe on my blog using one of the sauces. I had actually tried a few of the Chatkhaar sauces before I received the gift pack. Initially they were were delivery only, however, once they started stocking at supermarkets, we got them from Imtiaz. The part that impressed me was that they created a line of gourmet sauces keeping the product and branding strategy completely different from the parent company "Naurus". The sauces themselves are a welcome change from the typical ones available in terms of variety, flavor profile and versatility of usage. Also, while the price point is higher than ketchup and chilli garlic, it is good value for money considering the quality & flavor of the sauces. The gift pack that I received contained what they considered to be their most popular sauces, the Piri Piri sauce, the Arabian Garlic Sauce & the Sweet Chilli Sauce. The concept behind the sauces is that each one of them represents a specific country, with the name of the sauce is written in local language on the packaging as well. Thus in the case of Sweet Chilli Sauce, the product name is also given in Thai. The Piri Piri sauce is the classic spicy table sauce, ideal as a dipping for snacks but also good for marination. The Arabian Garlic Sauce is one of their milder sauces, and is great as an accompaniment to grilled chicken, added in a shawarma wrap, or even added in salads as a mild dressing. However, it was the Sweet Chilli Sauce that I personally found the best and featured in the recipe below. 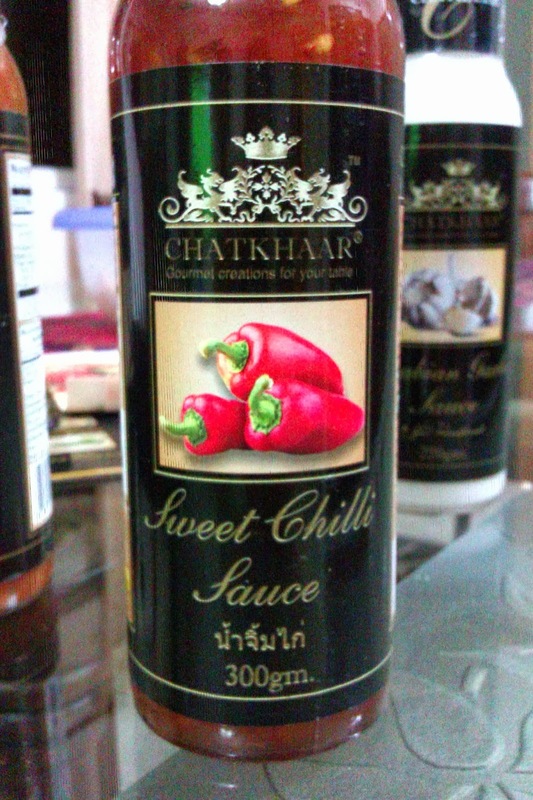 The sauce is sweet, but not overly sweet and has a major spice kick from red chilli flakes. Anyone reading this blog on a constant basis would know of my love for chilli flakes, and completely understand why this particular sauce appealed to me. I was switching between recipes, but the one recipe that instantly kicked was a typical Thai appetizer - Thai Sweet Chilli Wings. This is actually my first time making wings, and it all started with a mini-lesson in butchery on using the proper knife and how to get the skin off from my mother. But after I had managed to get that out of the way, I am glad that the recipe itself was a success. 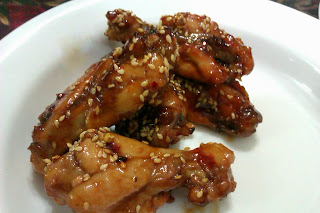 Instead of frying the wings which would make them more fattening, I decided to bake them in the oven ensuring that they were cooked perfectly with no raw chicken wing, and coated with that sweet & spicy sauce, the wings were a resounding success. The recipe can itself be easily adjusted to other cuts of chicken, like boneless chicken & even chicken drumsticks for a yummy appetizer. Disclaimer: PR samples sent by the company for review & trial. However, this has not affected my opinion regarding the product itself. Cut the chicken wings into three pieces - wings, drumettes and wing tips. Discard the wing tips or reserve them for making stock. I prefer skinless wings which is why I removed the skin from the wings. The best method is to to ask the butcher to clean & cut up the wings, however, if the wings are in one size, then it would be best to google up an instruction video on cutting wings for help. Keep the wings in a big bowl. 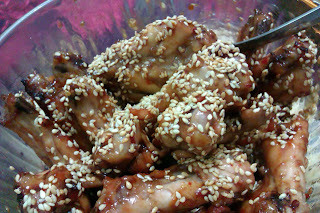 Take a medium sized bowl and add the Chatkhaar Sweet Chilli sauce, brown sugar, salt, red chilli flakes, sesame oil and mix well together. Add about 3/4th of the sweet chilli mixture to the chicken wings and mix well together making sure that all wings are coated properly. Leave to marinate for at least 20 minutes. Pre-heat the oven to 200 C for at least ten minutes before about to put the chicken wings inside. Line a baking sheet with aluminium foil and then spread the chicken wings in a single layer on the baking sheet. I used one big baking sheet but two small baking sheets can be used as well. Do make sure that the baking sheet is properly lined since that will keep the mess to a minimum. Using a silicone pastry brush or a spoon, make sure that the chicken is properly covered with the remaining marinade. Bake for about 45 minutes, turning the chicken over with kitchen tongs after about 20 minutes to ensure that it is cooked on both sides. If using two baking sheets, it may take slightly more time to cook the chicken, and it is necessary to revove the baking sheet from top to bottom and vice versa to ensure heat is circulated properly. When turning the chicken over, the leftover marinade mixture can be used to coat the chicken. While the chicken is cooking, the juices of the chicken will release, and initially there will be a lot of water which will dry up into a sticky sauce by the time the chicken is cooked. Once the wings are baked, put them in a bowl and toss with the remaining 1/4th sweet chilli mixtture so that it is mixed properly. Garnish with toasted sesame seeds & spring onions. Mixed Pickle, Olive Pickle, Green Chilli Pickle, Sweet Lime Pickle & Lasoora Pickle. Great :) - do let me know the results! .. I use the Arabian Garlic as a sauce for wraps, sometimes add just a bit of Piri Piri for a kick .. you can use it in these recipes of mine ..
Just use the Garlic sauce instead of the dips that I have used in the wraps i have used - its just so much simpler than making it from scratch :) .. and for the mezze, you use the falafel as the protein, with some vegetables and the sauce to bind it all together ..
Alternatively, dad has even used it as a salad dressing .. emulsified it with a little bit of olive oil & lemon juice, with salt & pepper as seasoning ..